During the summer, more than any other time of the year, hydration is important, but there’s no reason to settle for a plain water bottle. 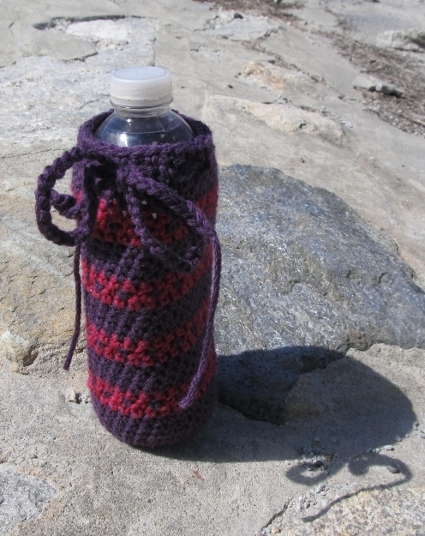 You can keep it close at hand as well as stylishly insulated with this simple wool water bottle cover! 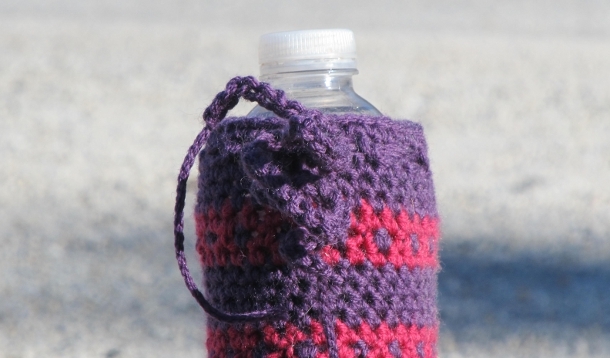 Note: Water bottle cover is worked in the round & is not turned after each round. With MC, start with a magic loop. Rnd 1: 6 sc in loop, join with a sl st.
Rnd 2: Ch 1, 2 sc in each sc around, join with a sl st to first sc. Rnd 3: Ch 1, * sc in 1st sc, 2 sc in next sc, rep from * around, join with a sl st to first sc. Rnd 4: Ch 1, * sc in next 2 sc, 2 sc in next sc, rep from * around, join with a sl st to first sc. Rnd 5: Ch 1, * sc in next 3 sc, 2 sc in next sc, rep from * around, join with a sl st to first sc. Rnd 6: Ch 1, sc in BLO in each sc around, join with a sl st to first sc. Rnds 7-10: Ch 1, sc in each sc around, join with a sl st to first sc, changing to CC in last stitch. Do not cut MC. Rnd 11: With CC, ch 1, sc in ea sc around, join with a sl st to first sc, changing to MC in last stitch. Do not cut CC. Rnd 12: Ch 1, * sc with MC, sc with CC, rep from * around. Rnd 13: With CC, ch 1, sc in each sc around, join with a sl st to first sc, changing to MC in last stitch. Do not cut CC. Rnds 14-34: Repeat rounds 7-13 three times more, cutting CC after last pattern repeat. Rnds 35-37: Ch 1, sc in each sc around, join with a sl st to first sc. Rnd 38: Ch 1, sc in first sc, * ch 1, sk next sc, sc in next sc. Rep from * around, ch 1, join with a sl st to first sc. Rnd 39: Ch 1, sc in first sc, * sc in next ch-1 sp, sc in next sc. Rep from * around, join with a sl st to first sc. End off. Weave in ends. 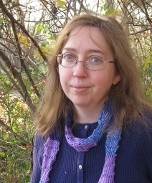 With MC, make a chain approximately 20” long (100 chains) or desired length, and thread through eyelets formed in Rnd 31.